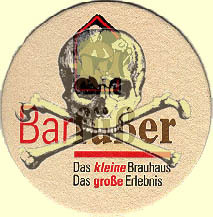 On the main street of the city of Heilbronn the Barfüßer brewpub is to be found on Allee 35, Tel: 07131 963441. This Heilbronn Barfusser pub has a very well designed cafe like interior with two floors and wickerwork chairs and has justifiably won awards for the layout. A pale Pils type Blonde, Weisse and dark Schwarze beer are available and these are pleasant drinking brews to enjoy with the atmosphere, the Schwarze has a nice malty aroma and smooth taste. It is a pity that other styles are not produced and one can only hope that this policy changes in the future. Between Karlsruhe and Heidelberg the town of Bruchsal hosts a brewpub called the Wallhall which was established in 1996. Situated near to the shopping centre the pub can be found at Kübelmarkt 8, 76640 Bruchsal, Tel: 07251 72130, Fax: 07251 721399. There are three rooms one of which contains the brewery. The staff are friendly and warm food is available from 11:00 - 14:00 and 18:00 - 23:00. Beers on tap include an all year round unfiltered Pils which is quite different to a classic Pils and can be described as very cloudy with a yeasty refreshing flavour. Quite bitter this beer suffers slightly from a high CO2 content but is ideal for drinking on a warm summers day. A top fermented "Dunkles" was also on tap but was not in the best condition and was too pale to be described as dark. 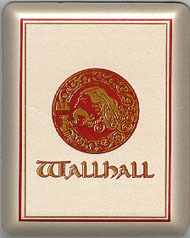 Other speciality beers are available at other times of the year. See the brewpubs own Website for more details. 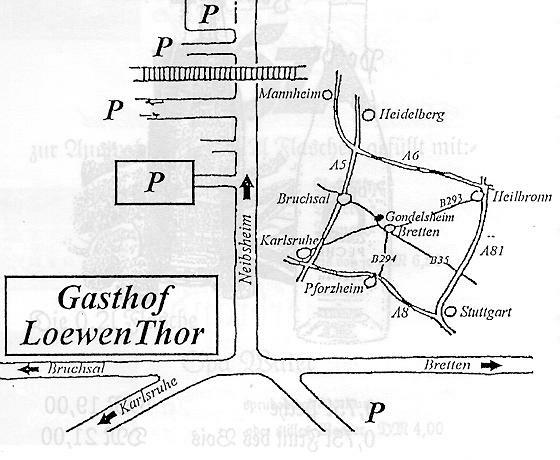 If you are tired of German beers and want a chance to try some choice Belgian ones in an exclusive atmosphere make a detour to the Loewen Thor in the small town of Gondelsheim which can be found in Bruchsaler strasse 4, Tel: 07252 6676, Fax: 07252 8202. This 1748 built guesthouse is very elegant and features many rooms of which the original dining room is the most spectacular. You will have to be prepared to spend some serious money here to get full enjoyment out of the experience, but it is well worthwhile as the menu is mostly composed of Belgian specialities. To compliment the meal the restaurant provides an impressive choice of the finest Belgian beers which are kept in very good condition. The restaurant is open daily from 19:00 to 1:00 except Sundays when it is open from 12:00 to 24:00. A typical 0.75 litre bottle costs around 20 DM in the restaurant and they can also be bought for take away with an additional cost for the bottle. 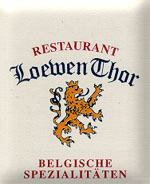 See the Loewen Thor's own Website for more details. About 10 km Northwest of Karlsruhe try not to miss a microbrewery opened in 1996 in the town of Eggenstein Leopoldshafen. Called Andreas Bräu this modern building has a well designed open bar structure with the brewery visible in one corner and there is a concrete tiled beer garden with umbrellas available outside. This brewery has now established itself as one of the few which produces varied beer styles of outstanding quality all year round. Crowds gather for the short seasons which feature both Doppelbock (February) and Maibock (beginning of May) proving that seasonal strong beers are still very popular in contrast to the belief of most large German breweries. The Summer Weizen beer is also exceptional with a pronounced banana aroma. A good range of other seasonal beers, all very good are available at differing times of the year. Due to its popularity the Andreasbrau is often very crowded in the evenings so it might be worth making a reservation to avoid disappointment. It is particularly nice to see people of all ages in the pub and it has become a real community centre. Recently Thai food has also become a popular item on the menu. 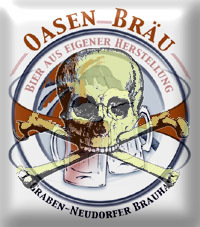 Another microbrewery opened in 2005 could be found in the town of Graben-Neudorf called Oasen Bräu and was situated in the industrial area just behind the main station of Graben Neudorf in the Benzstrasse 11, 76676 Graben-Neudorf. 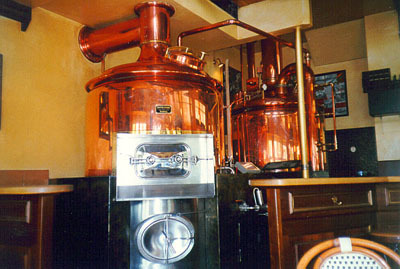 The brewpub produced Pils and Weizen year round with some seasonal specialities such as Märzen and Export. The premises inside were considerably larger than one would expect with a number of adjoining rooms as well as a small beergarden outside. The Pils, called "Baupils" was coppery coloured and more full bodied than many other examples in the area with a good balance of hoppiness and malt. Service was quick and friendly and there was a good range of food from daily menus. There are two medium sized breweries in Karlsruhe, Moninger and Hoepfner. 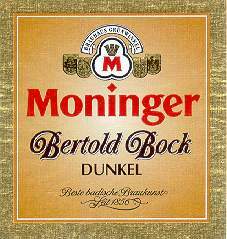 Moninger produces a nice beer in winter called Bertold Bock which is best if you can find it served on tap rather than from the bottle. The Hoepfner brewery now produces a wide range of beers, more details of which can be found on their own website, although special mention should be made to their Porter beer which has been re-introduced after a ten year absence. Available during the winter months this is the only Porter brewed in Germany and deserves to be tasted by those who are unaware of this beer style. Hoepfner has also recently re-introduced its fine Maibock after a few years absence and it is perhaps a forlorn hope that one day they will also re-introduce the excellent Carolator winter doppelbock which was one of the finest examples of this beerstyle. 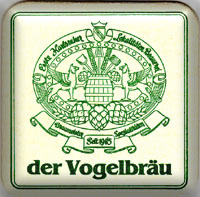 Essential to any beer lovers visit to Karlsruhe is a trip to one of the oldest established microbreweries in Germany founded in (1985) by Rudi Vogel called the Vogel Bräu (Bird Brew). Situated on Kapellenstrasse 50 Tel: 0721 377571, Fax: 0721 370902 they serve an refreshing unfiltered Pils all year round, and between Oct. and May speciality beers are produced from Märzen to Doppelbock, Dunkles Weizen, Weizenbock, Mai bock and even a Rauch beer unequalled outside of Bamberg. These speciality beers are of the finest quality and can be enjoyed with simple snacks or a choice of two or three daily menus. The original bar with a good view of the brewery has expanded twice already into adjoining rooms due to its popularity and when the weather is fine the beer garden is usually full. A second Vogel Bräu can be found in the district of Karlsruhe Ettlingen which can also get very full especially on Sundays when they have good live music. A third Vogel Bräu in the Amalienbadstrasse 16, Karlsruhe Durlach also opened at the end of 2004 which is more of a cafe style bar than a pub and aimed to appeal to a slightly different audience. A third medium sized brewery in Karlsruhe used to be the 1885 established Brauerei Max Wolf which was situated right in the centre of town at Werderstrasse 51. 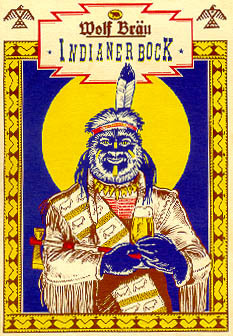 Their Indianerbock which was served in stone mugs was an excellent relatively strong beer with a full taste and a slightly bitter finish. Unfortunately the Wolf brewery closed down in 2009 and was taken over by the large Heidelberger brewery who may still produce some of the Wolf beers for bottling. 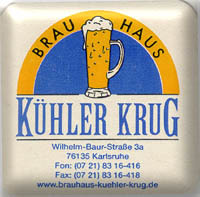 Another brewpub which has been setup by the Moninger brewery can be found in Karlsruhe and is called the Kühler Krug. This is a large complex which can cater for many visitors and is situated in the Wilhelm-Baur Strasse 3a, Tel: 0721 8316416, Fax: 0721 8316418. The usual Helles, Dunkles and Weizen beers are available which are of good quality, although the Weizen is perhaps a bit ordinary. A surprisingly good fruity full bodied seasonal Maibock is also worth trying out if you are visiting during its period of availability. 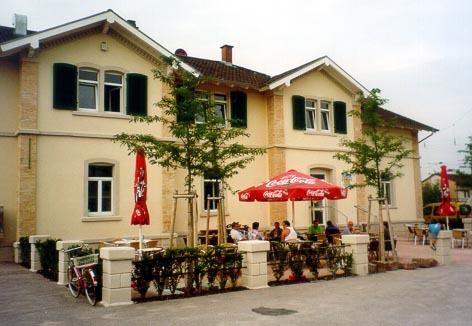 The large beergarden and its proximity to the park and childrens playground make this a popular family destination in Summer. Kühler Krug beers are also available from a number of local supermarket outlets in returnable bottles. The brewpub also has its own Website. 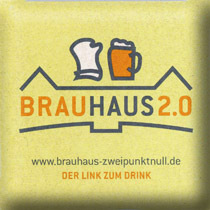 In the Karlsruhe suburb of Knielingen on the site of the former US Military Installation, Gerszewski Barracks there is a large brewpub called Brauhaus 2.0. The brewery is situated in the building that used to be the officers canteen and the address is Egon-Eiermann-Allee 8, 76187 Karlsruhe, Tel: 0721 47050220. All the other military buildings were demolished except the church. First opened in 2011 as a sister brewpub to the Waldbronn Lindenbräu, this first version of the brewery was not commercially viable due to the massive redevelopment of the area which progressed slower than expected leaving the brewery in a rather desolate wasteland. Consequently the brewpub closed only 9 Months after opening. By 2013 new housing and commercial properties had been constructed and the second version of the brewpub was opened in much better surroundings. Open from 11:00 to 24:00 every day this brewpub now appears to be a great success and is often quite full, especially on warmer days. Plenty of room both inside and out in the large beergarden the premises also offer enough parking spaces. Brew master Jochen Martin produces 2 regular beers year round, a Tettnanger hopped BIO-PILS 2.0 and a BIO-WEIZEN 2.0. Another regular beer is a 5.8% Alc. BIO-Alt 2.0. Both the Pils and Weizen are good examples of the style and are very popular. They do brew a few different seasonal beers throughout the year but usually do not advertise them on the website so it can be a bit of pot-luck what is available. Their Märzen and Maibock seasonals are good examples of the style. 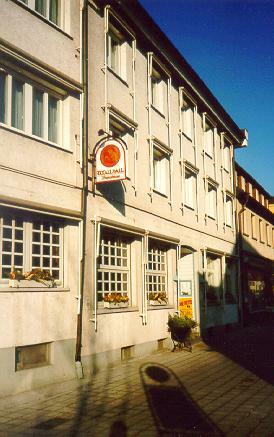 Reasonable food is also available with their Flammkuchen being a particular favourite. As development of the area continues with even more housing and with a planned extension of the tram line from Karlsruhe central, Brauhaus 2.0 is likely to remain popular. 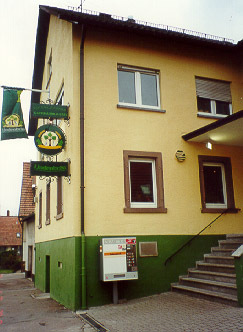 Now permanently closed, the Michelbräu brewery in the Karlsbad suburb of Ittersbach first re-opened as of November 2009 in the Stockmädle 10, 76307 Karlsruhe Ittersbach. 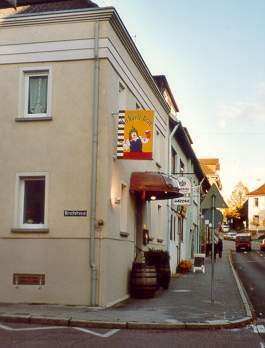 Originally opened at the end of 1999 the beers were only available in the Gasthaus Rössel in the centre of Ittersbach. Beers available included Pils, Kuckucksbier and Weissbeer. From the original tasting notes the Pils was an unfiltered, hoppy, refreshing beer rating amongst the best of this style and the Kuckucksbier was a bitter amber coloured brew resembling a Märzen in style. 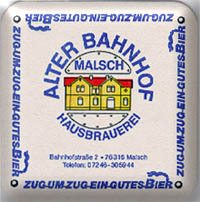 Open since September 2001 the Alter Bahnhof brewery, as its name indicates occupies the old station building and is well worth a visit for its excellent beers. The complete address is: Bahnhofstrasse 2, 76316 Malsch, Tel: 07246 305944, Fax: 07246 305946. The brewpub which seats 150 is open from 16:00 to 01:00 Monday to Thursday, 14:00 to 03:00 Friday and Saturday and from 10:00 to 01:00 on Sundays. Brewer Andreas Kühn learned his profession from trade school as well as from his own home brewing efforts and has certainly been successful in producing first class beer. 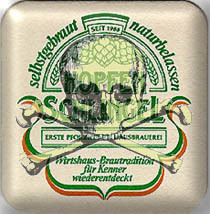 The brauhaus Hell is an unfiltered, well balanced brew with excellent tettnanger hop character and is highly drinkable. Even more exceptional is the smooth dark amber coloured Dunkles which has an outstanding malty aroma and taste, again with a particularly well balanced character. Both beers are served at perfect temperature which goes against the "too cold" trend found in many of the newer German brewpubs. A reasonable Weizen is also available which has a slight, but not too pronounced banana aroma and taste. Around Christmas time another treat not to be missed is a glass of their superb dark Doppelbock which is one of the best examples you will find in this guide. Full bodied, dark, malty and smooth, it is fortunate that the brewery is right on the station as it would not be wise to try driving after a couple of these. Other speciality brews such as Maibock should be available at other times of the year. The place outside the main entrance is reserved for the beergarden with seating for about 70 people, although this is perhaps less inviting than the interior due to its exposure and location next to the street. Simple well cooked meals can be enjoyed along with the first class beers. Definitely an address worth seeking out for some of the finest beers you will find in this guide. This brewery opened its doors in November 2000 and has rapidly become extremely popular with the locals. 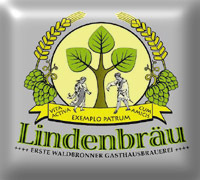 The Lindenbräu can be found in the Stuttgarter Strasse 43, 76337 Waldbronn, Tel: 07243 652881, Fax: 07243 652882 and further details can be found on its own Website. Brewer Ralf Störzbach earned his brewing diploma in Weihenstephan and produces Lindenbräu Original and Pils with occasional seasonal beers. The Original is a coppery coloured unfiltered 'light' Märzen style beer which is rather too dry to really be called Märzen and is difficult to categorise precisely. A pleasant drink without any particularly outstanding characteristics. 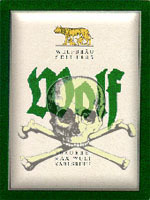 The Pils is a very full bodied example of this style with a good level of bitterness and a distinctly hoppy character. A pleasant lingering aftertaste makes this a very enjoyable beverage. A truly outstanding Lindenbräu beer which is only available for a couple of weeks during February is Maximator Doppelbock. This beer is specially matured with Oak chippings and has a Stammwürze of 21% and 9% Alc. which makes it one of the strongest beers available on draught in Germany. Maximator has a delightful complex aroma and taste which is reminiscent of the old Reichelbräu Icebock of similar strength. This brewery is well worth a visit. 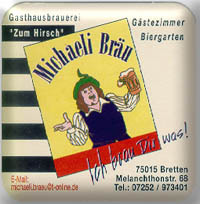 Opened in 2000 the Michaeli Bräu run by brewmaster Michael Kuhn is located in the town of Bretten at Melanchthon Strasse 68, 75015 Bretten, Tel: 07252 973401. This small brewpub (If it is still operating ?) occupies the completely renovated site of the old 1825 established Hirsch and is very welcoming and friendly. Open all week from 16:00 to 00:00 with no restday (Ruhetag). The brewery offers a very interesting range of beers including an excellent refreshing pale amber 12.4% Stammwürze Pils which is very well hopped (Hallertau) and ranks amongst the very best Pils that can be found in the area. Also available is a very dark, fairly dry 12.4% Stammwürze beer called Alte Liebe made in the Alt beer style which with its strong toasted malt aftertaste reminds one of a light stout. Another fairly unusual offering which is seasonally brewed is a 12.8% Stammwürze Roggen (Rye) beer which is smooth and fairly sweet with a slightly syrupy character. This is a very interesting beer which is perhaps not to everyones liking but should be tried as it is quite rare. Finally an even more unusual beer is sometimes available called Hanf (Hemp beer). Before 1516 hemp was one of many ingredients used in brewing but was banned in Germany after the introduction of the Reinheitsgebot. Hemp and hops actually belong to the same family as marijuana (cannabina ceae) but they are not the same plant. Industrial hemp and marijuana are only cousins. The beer is made either from flowers or sterilised seeds which contain no or (in the case of flowers) very little THC, which is the psychoactive ingredient in marijuana. Some other hemp beers are available from Weitra-Bräu in Austria or Wädi-Bräu in Switzerland as well as a couple of newcomers in the USA. Having never tasted this type of beer before I cannot make any comparisons but the Michaeli Bräu Hanf beer tasted a little like a Belgian Gueuze made by spontaneous fermentation and was slightly sour which will not be to everyones liking. Anyway an interesting beer to try and broaden your beer horizon. Another particularly unusual offering comes in the form of food. On Tuesdays you can even try your hemp beer with a plate of Kutteln (testicles). In summary this brewpub is well worth a visit, and has a range of excellent beers with a particular plus point for the Pils which is perhaps only equalled in this guide by the Pils from the Hausbrauerei Feierling in Freiburg. 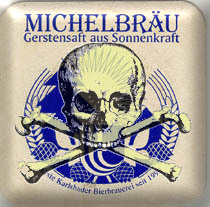 Brewery website ceased working in 2010 but the Brewery tap guesthouse still operates and they say that Michaelibräu beer is still available although it is not clear if it is still brewed on site. 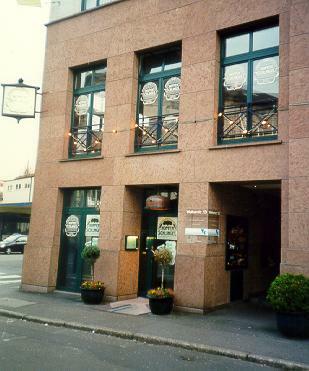 The Hopfen Schlingel is Pforzheims first brewpub established in 1988 and is situated in Weiherstrasse 13 just of the main thoroughfare Tel: 07231 24477. Pforzheim is known as the goldstadt and there are many jewellers to be found around the busy shopping area where parking is difficult to find. The Hopfenschlingel is open from Mon - Thur 11:00 to 24:00, Fri - Sat 11:00 - 1:00 and on Sunday from 17:00 to 24:00. There are two areas comprising of the bar on the ground floor with a view of the brewery and a projection screen TV for the football fans plus a quieter first floor area with more tables suitable for meals. The pub is very friendly and well laid out with a quite bitter average Pils all year round and one speciality beer which was a refreshing Dunkles when visited. As with the Stadtlerbräu above the beers tasted were good but unexceptional for a brewpub which should be able to better the quality of the local big breweries. The food available in the Hopfenschlingel is good and they prepare Flammkuchen which is a speciality of the French Alsace region and are like thin Pizzas with various toppings. The group now has its own Website which covers the 2 locations in Rastatt and Pforzheim. Very little information about the beers available.